In False Dawn, Steven A. Cook examines why Egypt, Libya, Tunisia, and Turkey did not transition to democracy, explaining how and why Middle East uprisings didn’t succeed. Nearly a decade after Arabs across the Middle East poured into the streets to demand change, hope for democracy has disappeared in a maelstrom of violence and renewed state repression. 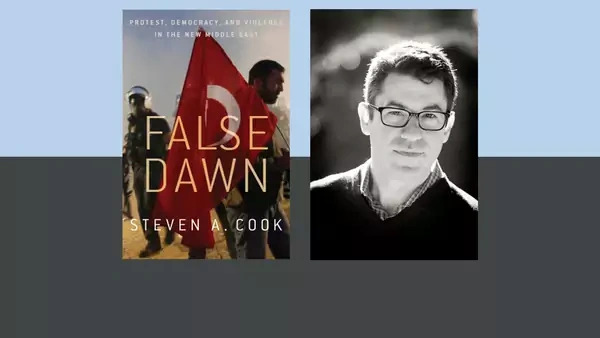 In False Dawn, noted Middle East expert Steven A. Cook examines events across the region from the initial uprising in Tunisia to the failed coup in Turkey to explain why Middle Eastern countries did not make transitions to democracy. Despite appearances, there were no true revolutions in the Middle East eight years ago: none of the affected societies underwent social revolutions, and the old structures of power weren’t eliminated. Even purported successes like Tunisia still face significant barriers to democracy because of the continued strength of old regime players. Libya, the state that came closest to revolution, has fragmented into chaos, and Turkey's president, Recep Tayyip Erdogan, has used the repressive institutions he promised to change to undermine his opponents and reinforce his personal political power. After taking stock of how and why the uprisings failed to produce lasting change, Dr. Cook considers the role of the United States in the region. What Washington cannot do, he argues, is shape the politics of the Middle East going forward. While many in policymaking believe that the United States must "get the Middle East right," American influence is quite limited; the future of the region lies in the hands of the people who live there. An excerpt from False Dawn can be read here. What role can international institutions play in encouraging democratic transitions? Discuss how each major paradigm of IR theory (Realism, Constructivism, Liberalism) views the Arab Spring. Why or why not is it surprising that intra- and inter-state conflict has increased in the Middle East since the Arab uprisings? What is the state of democracy in the Middle East today? What role can external actors such as foreign governments, NGOs, UN, IMF or the World Bank play in encouraging democracy in the Middle East? Could the Arab Spring have succeeded today? Have there been lasting elements of success in any of the four countries discussed in False Dawn? Does the United States have an obligation to promote democracy abroad? Is the promotion of democracy a national interest of the United States? Through what methods does the United States advance democracy in other countries, and in what instances has this been done? Write an 800-word opinion piece arguing whether Tunisia should or should not be considered a democracy. Was it inevitable that the Arab uprising would fail to produce democracies? Are there any countries in the Middle East that are ripe for a transition to democracy today? Why or why not? Imagine you are an official on the National Security Council and Egypt has experienced a coup d’état deposing a democratically-elected government. Write a five-page policy memo making the case either for or against the development of a relationship between the United States and the newly installed authoritarian ruler. The paper should focus on whether or not it is better to have a relationship with a stable dictator or encourage instability in favor of democratic change. If you think the decision between stability and democracy is a false choice, please explain. In pairs, select one of the topics below. Decide who will argue which side, and present your argument with supporting evidence to the class. The class will determine the winner of the debate based upon which argument is most compelling and provided the best evidence. The Arab Spring did/did not have positive consequences for the Middle East. There were/were not revolutions in the Middle East in 2010 and 2011. The United States does/does not still have an important role to play in the shaping of the future of Middle East politics. Write a twelve- to fifteen-page National Intelligence Estimate (NIE) about the future political and social landscape of one of the four countries discussed in False Dawn (Egypt, Libya, Tunisia, or Turkey). Include three possible scenarios, ranked from most to least likely. Include indicators that U.S. intelligence officers should look for that point toward these future scenarios, and explain what these situations would mean for U.S. policy in that country. Sheri Berman, “The Continuing Promise of the Arab Spring: Why Nostalgia for the Ancien Regime is Misguided,” ForeignAffairs.com, July 17, 2013. Jason Brownlee, Authoritarianism in an Age of Democratization, (Cambridge: Cambridge University Press, 2007). F. Gregory Gause III, “The Middle East Academic Community and the ‘Winter of Arab Discontent’: Why Did We Miss It?,” in Seismic Shift: Understanding Change in the Middle East, ed. Ellen Laipson,. (Washington, DC: Henry L. Stimson Center, May 2011), 11–26. William Hale and Ergun Ozbudun, Islamism, Democracy, and Liberalism in Turkey: The Case of the AKP (New York: Routledge, 2010). Shadi Hamid, William McCants, and Rashid Dar, “Islamism after the Arab Spring: Between the Islamic State and the nation-state,” Brookings Institution, January 2017. Steven Heydemann, “Social Pacts and the Persistence of Authoritarianism in the Middle East,” in Debating Arab Authoritarianism, ed. Oliver Schlumberger (Stanford: Stanford University Press, 2007), 21–38. Juan J. Linz, “Transitions to Democracy,” Washington Quarterly 13, no. 3 (Summer 1990): 143–64. Indira A.R. Lakshmanan, “Eight years since Arab Spring, is there hope for Middle East democracy?,” Boston Globe, January 23, 2019. Marc Lynch, “Obama and the Middle East: Rightsizing the U.S. Role,” Foreign Affairs, September/October 2015. Marwan Muasher, “The Next Arab Uprising: The Collapse of Authoritarianism in the Middle East,” Foreign Affairs, November/December 2018. Kenneth Perkins, A History of Modern Tunisia (New York: Cambridge University Press, 2014). Kenneth M. Pollack et al., The Arab Awakening: American and the Transformation of the Middle East, (Washington, DC: Brookings Institution Press, 2011). Frederic Wehrey, The Burning Shores: Inside the Battle for the New Libya (New York: Farrar, Straus, and Giroux, 2018).